The RORC Season’s Points Championship continues this weekend with what looks like a tough race in strong winds to Cherbourg. Over 100 yachts will be competing the Morgan Cup. Dating back to 1929, the solid silver trophy is one of the oldest and most prestigious prizes. Weather models are predicting a wet beat to Cherbourg; it could well suit those yachts and crew that can best handle the tough conditions. Tactical weather expert Mike Broughton will be in the afterguard of pocket rocket Keronimo for the race. “A large area of low pressure has been stationary 200 miles west of Ireland all week," reports Broughton. "By Friday morning it looks like a secondary low pressure system will be riding around its southern flank, moving like a slingshot towards the south western approaches. There will be gales in the western channel with Force 6/7 in the central channel from the westerly quadrant. However, it all depends on the final track of this system; even a little change in its direction will make a big change in the conditions for the race. It certainly looks like being windy on Saturday morning with potentially 25 to 30 knots from the west at dawn. If the low pressure system tracks south or intensifies, we could see significantly more wind and a difficult sea state." IRC Zero will be a match race between two high performance racing yachts: Derek Saunders’ Venomous and Rob Gray and Sam Laidlaw’s Bob. IRC One could well be a skirmish between Piet Vroon’s Ker 46, Tonnerre de Breskens and Jonathan Goring’s new Ker 40 Keronimo. However Chaz Ivill’s Grand Soleil 54 John B and Mike Greville’s Ker 39 Erivale are also proven race winners. 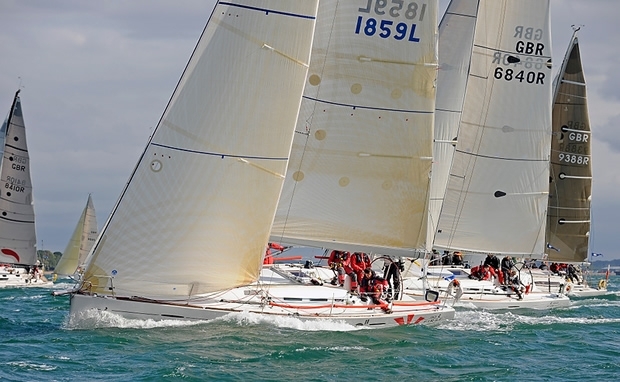 IRC Two has 32 yachts entered and the largest class could probably be described as the most competitive racing to Cherbourg. Niall Dowling’s J/111 Arabella currently leads the class for the season but is not competing in the Morgan Cup. However, RORC Commodore Andrew McIrvine’s First 40 La Réponse will no doubt be in fierce competition with Neil Kipling’s J/122 Joopster. They are currently second and third in IRC Two. IRC Two has a wide variety of well-sailed boats including ten First 40.7s who will also have their own private battle. IRC Three has eleven J/109s racing, and they are fast exciting boats; especially off the breeze. However this race looks like it could well favour the heavier displacement boats. 17 yachts are entered in the Two-Handed Class. Nick Martin’s J/105 Diablo-J leads the 2011 Season’s Points Championship with Matthias Kracht’s JPK 9.5 Ultreia! lying second. The Le Havre based Ultreia! will be looking to continue their winning ways, having won class and second in IRC overall in last month’s Myth of Malham Race. RORC Racing Manager Ian Loffhagen believes that heavy weather sailing experienced this season by the competitors has provided ideal preparation for the highlight of the championship, the forthcoming Rolex Fastnet Race. The Morgan Cup Race starts at the Squadron Line at 1900 BST on Friday 17 June. Late Entries are possible until Thursday 16th 1900 BST.